Following an exchange of Tweets with Bumble and bumble. last week, we had an impromptu photo shoot with them at Bb. Salon Downtown, a sun-drenched space in the heart of Meatpacking. The idea behind the shoot was conceptualized by Allen Thomas Wood, one of Bumble's incredibly talented stylists whose work can be seen everywhere from Bobbi Brown campaigns to the pages of Vanity Fair. 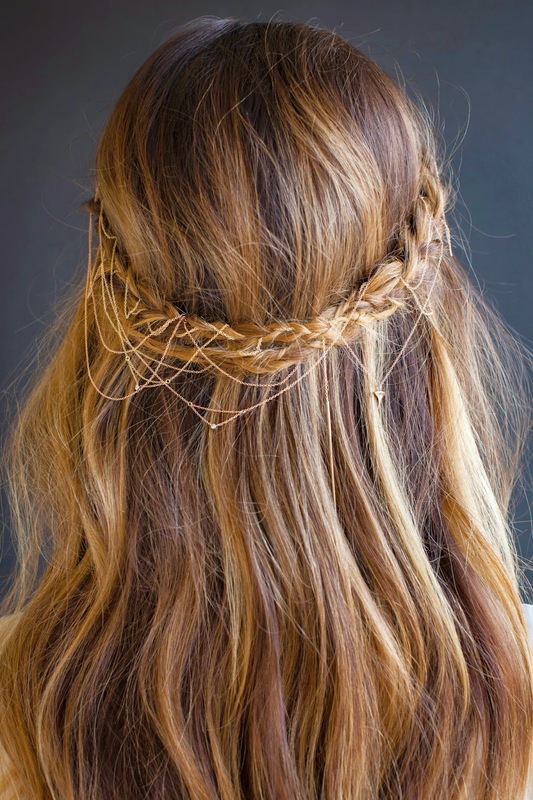 Allen's vision consisted of romantic tousled waves and messily wound-up plaits dripping in tiny gold Catbird jewels. Obviously we had to find out what this looked like. Read on for a few of the looks that Allen whipped up in 30 minutes flat (seriously, he's a pro), along with some tips on how to recreate the look at home. Not guaranteeing that you'll be able to nail this in the same time frame, but how inspiring is it to see jewelry repurposed in such a refreshing way? After all, that's how the knuckle ring started. And it's where the fun is. Rough dry Bb. Surf Spray into the hair to create texture. Working off natural center parting, split hair into two sections and french braid into two pigtails - finishing off the braids at the lower back of the head. 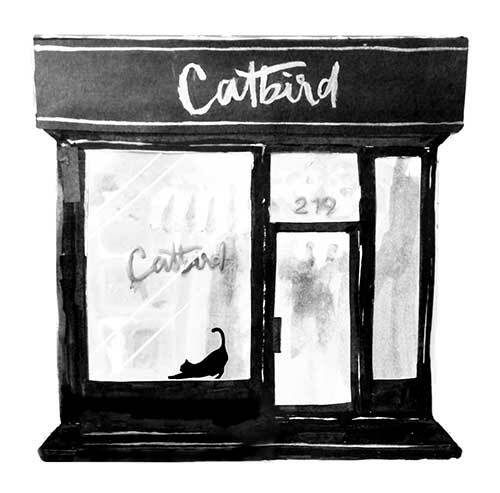 As you braid, occasionally weave a Catbird ring into the strands and crisscross. Coil the two braids against the back of the head to create a flattering shape - pin into place. Finish with Bb. Spray de Mode hairspray. Apply Bb. Pret-a-Powder to roots and shake through to create volume and texture. Loosely wave the hair with a 1 1/4" curling iron. Burst Bb. Dryspun Finish throughout and shake to break up and create the perfect undone, beachy waves. 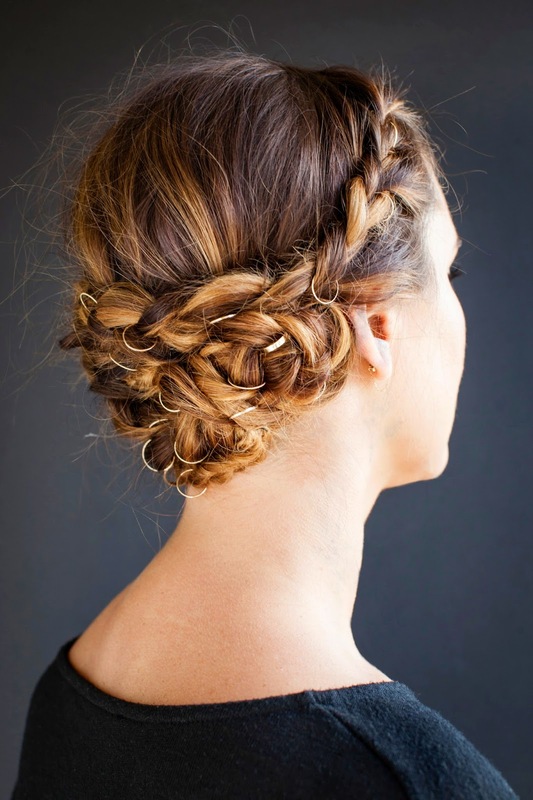 Working off the natural parting, create two small french braids along the hairline - finish off braids and rope around the back of the head/pin together to create a "crown". Weave Chained to My Heart and Rose Thorn necklaces along with some plain chains throughout, draping in places and leaving ends dangling here and there to finish. Shake Bb. Pret-a-Powder throughout hair from roots to ends for texture, grip and fullness. Create two smaller french braids along the hairline, working off of the natural parting. Braid the back half of the head into one or two larger braids. 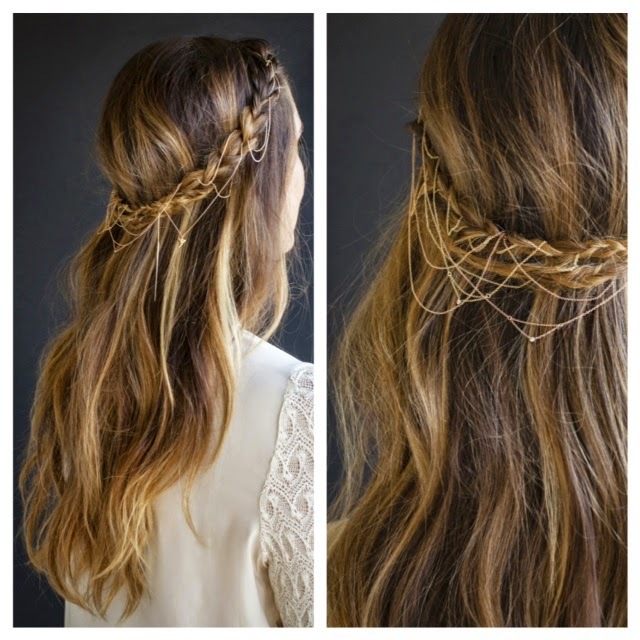 With all of the braids, occasionally weave a Catbird ring into the hair as you crisscross along. Wrap the two braids from the front of the head around to the back of the head and pin in place to create a crown-like effect. The one or two larger braids can sweep over the shoulder to finish. Hair by Allen Thomas Wood for Bumble and bumble.